Santa Cruz Metro workers, are ramping up pressure for a fair deal after their contract talks reached a stalemate. The contract for bus drivers, mechanics, and other workers, expired this week, but was extended for one week while the talks continue. The workers maintained a three hour picket line at the downtown bus station Wednesday, after talks with management broke off. Transit workers around the nation have been facing off with employers over health care and wages. In Oakland, CA a strike of 2,300 Bay Area Rapid Transit workers was derailed early Wednesday morning, after union officials, and BART management agreed to contract terms. Elsewhere, union officials in Phoenix, AZ put the brakes on a June 30 bus strike, and in Philadelphia last month, SEPTA (transit) workers agreed to stay on the job without a contract until Sept 5. 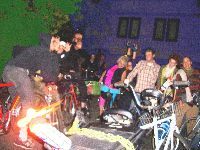 Santa Cruz had its first Midnight Mystery Ride two Fridays ago. 30 riders explored the dark hours of pedal powered play. It was announced at Guerrilla Drive-In where 200 people cheered, but when it was time to ride only 2 people came along. "Just follow the flaming can of PBR on the back of my bike, and maybe we'll pick up some folks along the way". We darted down creekside paths through the circles and emerged onto the ocean cliff, booming in the moonlight. The air was crisp and we jangled past the lighthouse: car free and serene. We rounded the bend to the Pub, expecting to see no one, but instead were challenged by an boisterous mob of bikey kids. "Where have you beeeeeen? We've been waiting 15 minutes....we already have our milk and cookies...we want to go....."
Did you know you can get to SFO by public transit, for just $10? This is only one example. Indeed, there are very few places you CAN'T get to by public transit. The problem is information. You'd need to contact three different transit agencies to plan a trip to the airport. The Metro Riders Union has a better answer: an easy, online transit guide geared to people who live in Santa Cruz. 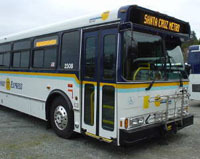 Unlike a transit agency Web site, which only covers transit routes in one city or county, we are free to cover lots of different routes in lots of different places. We hope that the site will grow and evolve. We plan to add leisure destinations like Big Sur, the North Coast, and the Napa Valley. (Bet you didn't know you could take transit to those places!) We also want to make the site more interactive. For now, you can post short questions, comments and suggestions to the public forum. SANTA CRUZ COUNTY, California. On September 11th and 12th The Campaign for Sensible Transportation will be holding a two day, fundraising book sale, benefiting the No on Measure J- "Widening 1 Won't Work" campaign. No on Measure J is opposed to Meaure J, the highway widening sales tax initiative. The initiative will be on the ballot in November. If passed it will raise the county's sales tax primarily to widen Highway One from Santa Cruz to Watsonville. This article describes a labor arrangement that affects many thousands of people in Santa Cruz County. The employer is not the University, the County Government, or even the Seaside Company, owners of the Boardwalk. Most of the people affected aren't employees, for that matter. What follows is an analysis of a contract. It's a real contract, in effect today, right here in our county. The rules are from the contract between Local 23 of the United Transportation Union (UTU) and the Lift Line division of Community Bridges. The contract covers paratransit van drivers. Half of their work involves transporting the 3,400 people who are currently registered for Americans with Disabilities Act (ADA) paratransit. The rest of their work involves transporting clients of other programs, such as Medi-Cal (medical insurance for the very poor). UTU, for its part, doesn't seem to want us to know what's in the contract. I mentioned, at a recent Metro board meeting, that the UTU/Lift Line contract was on the UTU Local 23 Web site. The files were gone within hours, replaced by a dummy screen saying that the information was password-protected (by permission only!). It is a dummy because, unlike the other password-protected parts of UTU's site, this one does not have a place for you to enter a password. Even before the contract was removed, UTU had deleted Appendix A, the pay scale. What could UTU be hiding from the public? Since we pay for and/or use the service, shouldn't we be allowed to see the document? what about the midnight mystery ride on friday? anyone know what's up with the midnight mystery ride? On November 5th, I briefly spoke with a Santa Cruz County bus driver to hear his reactions to the end of the month long strike. "... the debate is over. We know the science and we see the threat. Most of all, I say that we know the time for action is now. Global warming, and the pollution and burning of fossil fuels that cause it, are threats we see here in California and everywhere around the world. " Yes Arnold, and greed for fossil fuel profiteering has pitted the Bush administration against the leaders of the Arab world for the past 5 years.